Students who intend to take the B.Ed entrance test and the NET examination are in a quandary as both are scheduled on the same day and at the same time, that is, on the afternoon of June 27. The clash of dates came to the knowledge of some students today when they approached the counseling centre of the Indraprastha University at Kashmere Gate. The Economic Offences Wing today claimed to have arrested a person on the charge of embezzling US $5,30,000 from an NRI’s account in Delhi. The Delhi Police Commissioner, Dr K K Paul, has asked his senior traffic police officers to ascertain the feasibility of a simultaneous ‘fire alert’ in the Police Control Room during fire emergencies in the city, so that the traffic personnel could keep the approach roads clear for the fire tenders. Is it back to glass syringes in govt hospitals? Mr Roshan Lal, a member of Sonepat Block Samiti, was reportedly kidnapped by some car-borne miscreants from his house at Shahzadpur village, about 5 km from here last night. According to a report, the miscreants arrived around 10 pm and whisked him away in the car. As he was being pushed into the vehicle, he raised the alarm. Roshan Lal’s wife rushed out of the house and saw him being forced to sit in the car. Five persons, including two children, were killed and nine seriously injured in two different accidents on GT Road, Dadri. Five of the seriously injured have been admitted to government hospital, Ghaziabad. The relatives of the injured created a commotion in the hospital, alleging that they were not being treated properly. Fearing for his safety, the doctor on duty had fled from the hospital. The Delhi High Court today ordered the Sales Tax Department not to pass final orders with regard to its Rs 133-crore claim slapped on the public sector telecom major Mahanagar Telephone Nigam Limited for 2002-03 without the court’s permission. New Delhi: Three persons armed with knives last night robbed a taxi driver of his Indica car in the Sector-6 Dwarka of South-West district. 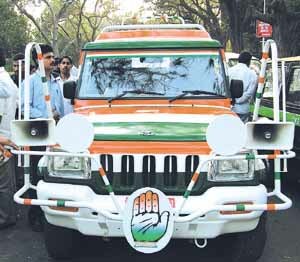 The car belonged to the Asian Tours and Travels, Sector-8 R K Puram, and was hired by an engineer Abhishek. A joint rally organised by the Samajwadi Party and the Rashtriya Lok Dal at Muzaffarnagar failed to impress the voters in Muzaffarnagar. A free for all was witnessed at the rally as the supporters of two dissidents leaders Kadir Rana and Amir Alam made an uproar in the rally in the presence of Chief Minister Mulayam Singh Yadav and RLD chief Ajit Singh. Programmes were organised across the country to pay homage to freedom fighters Bhagat Singh, Rajguru and Sukhdev on the occasion of their 74th martyrdom day. The Nepalese ambassador, Mr Karma Dhoj Adhikari, inaugurating the office of Everest Bank Ltd., (a joint venture with PNB) in the Capital. 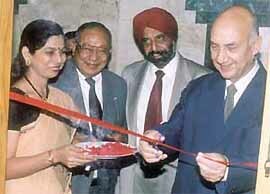 The CMD of Punjab National Bank, Mr S. S. Kohli, is also seen in the picture. Widespread resentment prevails among residents here due to the erratic power supply, frequent load shedding and low voltage. The power crisis in this city and elsewhere in the district has worsened with the onset of summer following the frequent load shedding being enforced by the Uttar Haryana Bijli Vitran Nigam. A farmer was deprived of his land compensation of Rs 31 lakh on the basis of forged documents. The land was acquired for the Gautam Budh Nagar University by the authorities. The local police recovered a decomposed body of a youth from a well located in a temple at Loharu road today. It is believed that the victim was an employee of a bank and was thrown into the well after being strangulated. Motor cycle-borne criminals robbed a Delhi trader of Rs 35,000 at gunpoint in broad daylight under the Sahibabad police station. Delhi businessman Sanjay Kumar is a supplier of sundry items in the area. He had come on his scooter to make collections from his clients in Sahibabad, Mohan Nagar area, at 11.50 am. An evening, which will take the soul to higher plane on a flight of mellifluous notes, is being organised at Bhai Vir Singh Sahitya Sadan on the 27th of this month. This year’s programme will include Raag Asa, which has been used in kirtans. The programme is an effort to reclaim the intangible heritage of sacred music among the members of the Sikh community. He did not believe in sitting on his laurels. Samey Pal Singh was using his expertise to manufacture country-made weapons in Surajpur industrial area. The only thing was that the police was on the look out for him. The rising crime in the area has created panic among the residents here. Two traders of nearby Beri town here allegedly received extortion letters for Rs 30 lakh. The incident has unnerved the local business community in the town. Incidents of looting are on the increase here. Criminals here decamped with cash and jewellery worth lakhs from the house of a sari trader on Sunday night under the Sihani Gate police station here. The Crime Branch has apprehended five criminals fron Bangladesh who were planning to commit a dacoity in Central Market, Lajpat Nagar. The sleuths received secret information that Bangladeshi criminals were planning to meet in Dakshin Puri for committing a dacoity at Prabhu Dayal Jewellers, Lajpat Nagar. Sonepat: With the arrest of six persons, the Kharkhauda police today claimed to have solved the murder of Maman Singh, president of the Brick Kiln Owners Association and contractor of Sehoti village, on February 14 last. 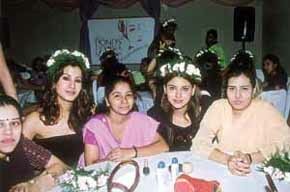 CONTESTANTS of the Ponds Femina Miss India 2004 are expected to verbalise the virtues of womanhood. Speeches, which are supposedly straight from the heart and promises of performing their duties, are a predictable part of the beauty pageants. Ponds Femina Miss India 2004 contestants share beauty tips with vocational trainees of Seva Niketan in Mumbai. Dupatta tera sat rang da! The mind boggles at the very thought of actually seeing a hole being cut through one’s head, but that’s exactly what the unnerving experience was for 36-year-old Dilawar Singh, a security guard from Panipat. 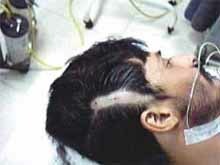 In a daring surgery, the patient was operated upon for brain tumor in a state of full consciousness. He observed and spoke to the staff even as the doctors were all deftly focusing on performing the intricacies of the operation. Tomorrow may go down as just another World TB Day. Our country, which is home to one-third of the global burden of the deadly tuberculosis, is perhaps still away from the offensive that was required to get proper control over it. As the scourge engulfs a human life every minute here, the all-powerful DOTS (Directly Observed Treatment Short-Term Course) programme has not been free of problems so far. A sparkling knock by Surinder Bajaj (99, 11x6, 4x4, 48b) and deadly bowling by Mukesh Dewan (3 for 26) helped Foreign Correspondents Club (FCC) defeat World Bank by 130 runs in the third Raymond Commonwealth High Commission Cricket Tournament. A delightful 69 by Dilip T.T and deadly bowling by Gaurav Chabra (4 for 23) helped Lal Bahadur Shastri Club defeat Rehman Club by 113 runs in an A-I Division match of the DDCA League at the Delhi University ground. A star-studded field will vie for the top prize of $ 300,000 in the Royal Challenge Indian Open Golf Tournament, to be held at the Delhi Golf Course from March 25 to 28. Over 160 golfers from 19 countries will tee off in the prestigious golf tournament. The field comprises 102 international players, 45 Indian golfers and seven amateurs. Union Minister of State for Youth Affairs and Sports Vijay Goel today met Prime Minister Atal Behari Vajpayee before leaving for Lahore to witness the fifth One-Day International match between India and Pakistan. A fine knock by Ashok Kumar (76) and deadly bowling by Sunil Sharma (3 for 12) helped Apollo Tyres defeat Pro Agro by 117 rus and entered the semi-final of the fourth Turf Corporate Cricket Tournament at the Guru Gobind Singh College ground. S.T. Micro defeated India Today by nine runs in the 8th Suntan Cup Cricket Tournament a the Airport Authority of India ground. Radio City 91FM will be presenting an Indo-Pak cricket special, ‘Cricket Ki Jung’. The cricket special will be spread across the Radio City stations in Mumbai, New Delhi, Bangalore and Lucknow.